The summer harvest of corn and tomatoes has arrived! 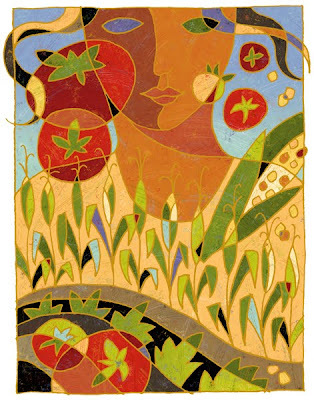 This image was inspired by the sweet corn grown by local farmers and the vine-ripe tomatoes that are at their best during this season. It’s Tuesday and I love getting my weekly email recipe from master cook and recipe guru Tori Ritchie. Here is a link to her website for a delicious recipe, “Smoky Corn-Tomato Relish” that makes great use of August’s bounty. And, you can also sign up for her Tuesday Recipe emails. Thanks for sharing Tori! This image is available as a limited edition fine art print. Please contact me if you’d like one.